No sooner had I placed my knife and fork together than my plate was swiftly removed from before me and disappeared behind a lace curtain in the hands of a young Rwandan woman. I stifled my disappointment at not being able to make a return trip to the buffet. I had taken a modest serving initially with the presumption that I would be free to return and eat to my heart’s delight. But in Rwanda, this was not the case. I had arrived in ‘The Land of a Thousand Hills’ two days previously, crossing the northern border with Uganda and travelling west through rolling hills, patch-worked in never-ending crops, to the lakeside town of Kibuye. 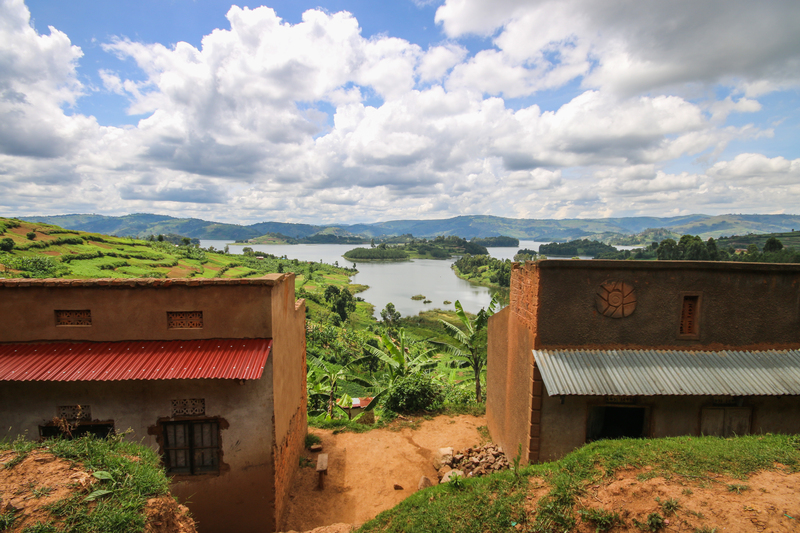 Despite its stunning setting, with Lake Kivu sprawling out at its base, Kibuye was notorious as the site of one of the worst massacres during the Rwandan genocide. Here, 90% of the Tutsi population were murdered – butchered and hacked to death by their former neighbours. Today, the staple foods of Rwandan cuisine covered every inch of available land. Terraces of cassava cascaded down to the lake shore where cages farming tilapia and sambaza peeked out of the aquamarine waters. Towering rows of maize hid graves bearing the number ‘1994’, and banana groves nestled at the entrance of a large church, displaying skulls and the words ‘Never Again’. Today Hutus sit eating next to Tutsis, but food had once been a source of division between Rwanda’s ethnicities. The Hutus were traditionally hunters and gathers with a predominantly vegetarian diet, while the Tutsis had been pastoralists with meat and dairy available in larger quantities – an inequitable distribution that had elevated tensions. The capital, Kigali, was abundant in international food and restaurants, catering to Rwanda’s new, progressive society. But in rural Rwanda melange was the standard lunch time feast – a starchy, but filling, option of locally sourced produce, and for many it provided the main meal of the day. Almost every restaurant you walked into presented a long table, lined with silver trays or pots, filled with the cook’s unique variations on umutsima (cassava and corn), isombe (cassava leaves with spinach) and mizuzu (fried plantains). A young woman sat down next to me at the table, a baby nestled in her back beneath vibrantly patterned fabric. Her plate was hidden under a carefully stacked, towering mountain of food – rice, cassava, plantain, potato chips, beans, stewed cassava leaves, and two meticulously rationed pieces of goat meat. Experience had taught her that, unlike buffets in the west, here you could only make one visit, and the more you could stack on your plate, the better value for money it was. Despite the choice of food available in this shack-like restaurant, a large portion of her plate was stacked with rice. ‘It is my favourite,’ she explained. Melange can be difficult to find in Kigali, but once you get out into the rural areas of Rwanda most restaurants will serve a buffet lunch. Many restaurants are without names and with each offering their own variation of melange, the best way to experience it is to just pick a place and dive right in. With prices at around $1.50 AUD, you really can’t go wrong!